Finland – Tour the Temppeliaukio Rock Church and other amazing architecture in Helsinki. Azerbaijan – Visit the Museum of Carpets as well as the Fire Worshipper’s Temple and witness the natural phenomenon known as the “burning mountain”. Greece – Tour Rhodes Town and visit the Palace of the Grand Master and the castle of the Knights of St. John. Bosnia and Herzegovina – View the iconic Stari Most as well as its minaret and bazaar. Italy – Tour Ferrari and Pagani factories and learn how these prestigious automobiles are produced. France – Taste the local wine and cheese on an excursion into the interior Basque country. Arrive at Helsinki International Airport where you are transferred to your suite at your landmark hotel. Meet fellow travelers and your Lakani Tour Manager at an evening cocktail party. Tour the highlights of the capital city, including Temppeliaukio Rock Church, Uspenski Cathedral, and Sibelius Park. 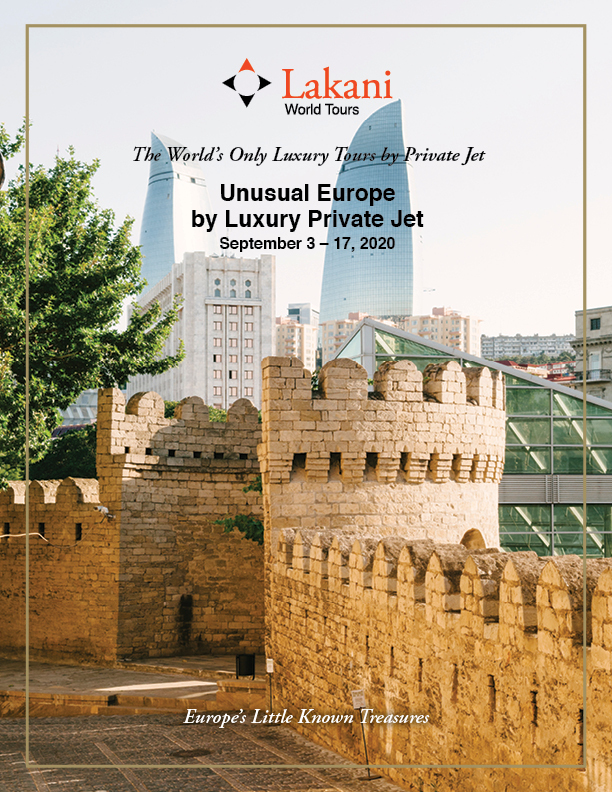 Board the Lakani Private Jet and fly to the capital of Azerbaijan where your suite accommodations overlook the Caspian Sea. Take a sunset cruise and dine at one of Baku’s ldest restaurant: Karvansaray. Explore the Old Town and the 15th-century Palace of the Shirvan Shahs. Visit the Museum of Carpets as well as the Fire Worshipper’s Temple and witness the natural phenomenon known as the “burning mountain”. Take the Lakani Private Jet to Rhodes, the largest of the Dodecanese islands of Greece. Drive the coastal road to your elegant and spacious villa with a large sundeck and private infinity pool. Walk through the narrow streets of nearby ancient Lindos and make your way to the castle and acropolis, by donkey if you choose. Tour Rhodes Town and visit the Palace of the Grand Master and the castle of the Knights of St. John. Travel by Lakani Private Jet to Mostar, one of the undisputed jewels of the Balkan Peninsula of Bosnia and Herzegovina to tour its iconic Stari Most (old medieval arched bridge) as well as its minaret and bazaar. Reboard the jet and continue across the Adriatic Sea to Bologna and your opulent Junior Suite. Tour the city by foot and drive to Ferrara for a walk through an Academy Award film site. Tour Ferrari and Pagani factories. Learn how these prestigious automobiles are produced and enjoy a ride in a Ferrari at Modena’s Autodromo. Board the Lakani Private Jet for your final leg to Biarritz on the Basque coast where your historic palatial hotel with Ocean view suites await you. See the Rock of the Madonna an Grande Plage on your tour of the city. Tour St. Jean de Luz and continue into Spain to San Sebastian for a Tapas lunch. Take an excursion into the interior Basque country; visit a pepper grower; explore picturesque village of St. Jean Pied de Port; and taste local wine and ewes cheese. Bid farewell to Europe and your newfound friends as you depart for the airport for your homeward bound or onward destination flight.